We’re resisting attacks on clean water protections. Are you with us? Protecting clean water has always kept us busy. 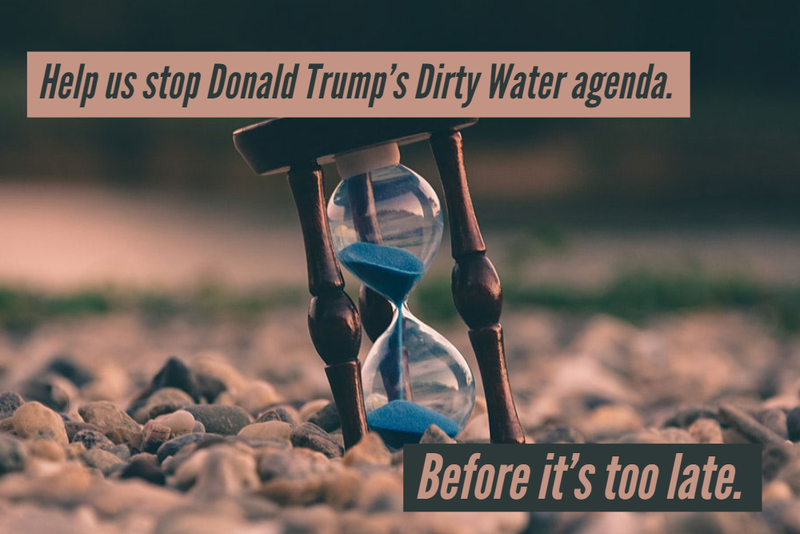 We’re rooted in our groundbreaking campaign to pass the Clean Water Act in 1972, and from the moment the Act was signed into law there have been corporate polluters and anti-government ideologues attempting to weaken or subvert the law. We’re used to fighting back for clean water. We’ve been fighting – and winning – for almost five decades to ensure and restore the protections that keep our water safe. But what we’ve seen over the past two years, from President Trump and the polluter friendly Congress, has been unprecedented. And we need your help with a special gift as 2018 winds down. Clean Water Rule – The Trump Administration has had this Rule, which protects drinking water for more than 117 million Americans, in its crosshairs since Day 1. We fought back by mobilizing thousands of grassroots activists to submit public comments opposing the repeal of these protections. We also took Trump’s EPA to court, and won, resulting in the Rule’s enforcement in nearly two dozen states. Coal Ash Protections – Toxic coal ash, often stored in unlined or inadequately lined pits, can leak into rivers and streams and pollute drinking water. But the Trump Administration gutted environmental safeguards for communities living near toxic coal ash dumps. We fought back by again, organizing thousands of Clean Water members to oppose this rollback through public comments to EPA. And, after winning a lawsuit over the Obama EPA’s weak coal ash guidelines, we joined another lawsuit to stop the Trump Administration’s coal ash rollback. Dirty Water Congress – The 115th Congress, which is in its lame duck session now, acted in lockstep with polluting industries time and time again. They used an obscure law to strip away protections that were enacted after a long deliberative process, including the Stream Protection Rule and the Oil and Gas Corruption Rule, and they repeatedly sought to include riders attacking the Clean Water Rule to must-pass legislation. We fought back by tracking every dirty water action they took and releasing our largest Congressional Scorecard to date. We also focused on targeted Congressional seats held by the “Dirty Water Caucus” and flipped those seats by electing clean water champions in New Jersey, Michigan, Texas, Minnesota, Pennsylvania, and California. We’ve been able to win in court and in Congress to stop many of these assaults on clean and safe water. But we need your help so we can not only keep stopping these attacks, but can change direction toward strengthening clean water protections. We have serious challenges ahead. Any day now, the Trump administration will be releasing its “replacement” for the Clean Water Rule, and while we don’t know all the details, we do expect it to be a dramatic step backward for protecting wetlands and small streams. Don’t wait until the end of the month – make your year-end gift today so that we have the resources to fight and win for clean water.